Diving in warm oceans comes with a cost, besides the airplane and room. Warm water means tropical settings, palm trees, reefs and …. bugs that will eat you alive. There are primarily two types of bugs that wish to feed on you and your blood — mosquitoes and microscopic sand fleas. 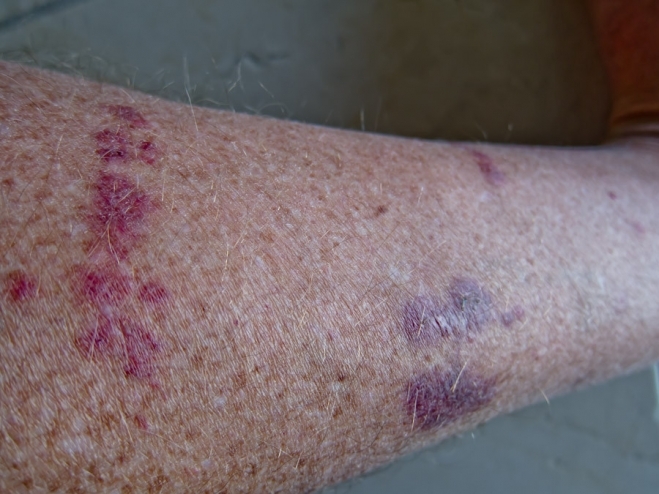 The welts in the above photo were the result of sand flea and mosquito bites which caused an allergic reaction. During the course of one week, there were over 50 bites on just one leg. Sand fleas and mosquitos inject their saliva containing an anticoagulant into the skin which allows your blood to flow into their bodies. Unless you are native to these tropical regions, most likely your body will have an allergic reaction that causes your cells beneath the skin to release histamines that rush to the site of the bite and cause additional swelling and itching. 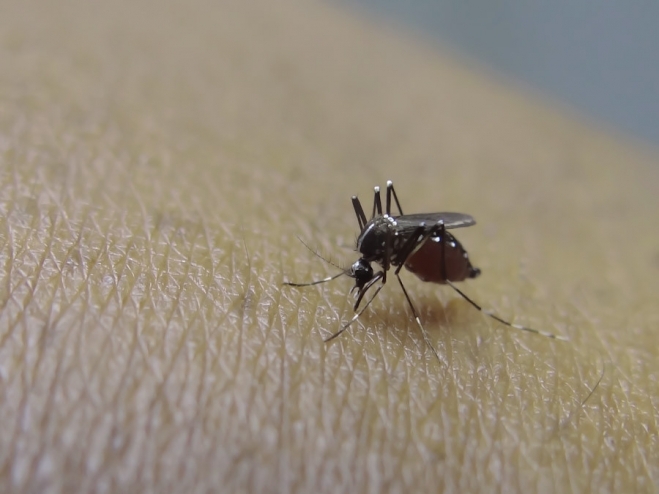 Of course, you should resist scratching the bites as this will delay the healing process and additionally cause more blood to release, attracting more biting insects. – Applying hot water directly onto the bites will help reduce the itching and swelling from the histamines. Sometimes the water coming out of a shower either in the hotel or on a boat is not sufficiently hot to deaden the itching. 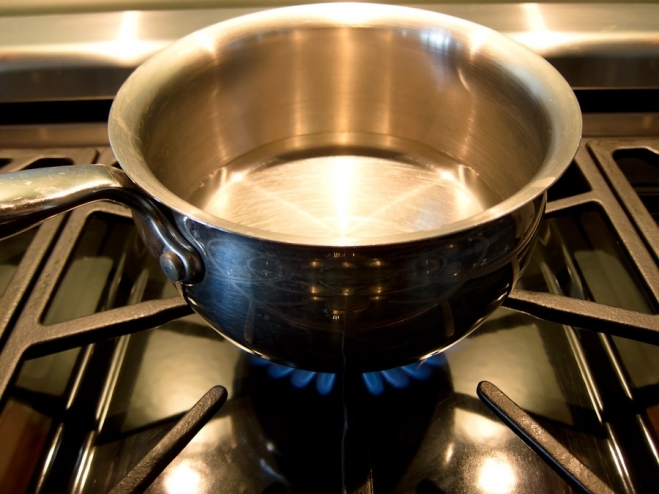 In that case, it may be necessary to reach a higher temperature by heating the water over a stove or fire. – Apply Seaweed Powder to the bites after the initial application of hot water. Allow it to set for a few minutes, then wash off with more hot water (as hot as you are able to take it without burning your skin). The combination of hot water and seaweed will give you 4-5 hours of relief, enough to get some sleep. Reapply these steps if you awaken itching or as needed during the day. – Stay off the sand, where the sand fleas live and reproduce. – Avoid walking around during the hour of sunset, when these bugs become most active. – Cover your skin, even in the hot tropics. Wear socks and stuff your pant legs into your socks to keep the insects from getting into your clothing. – Reapply some Johnson & Johnson Baby Oil to your skin. The bugs do not like the taste and will not bite through the oil to get at your skin. After a while you may get tired of the smell and having greasy skin. But that is preferable to dealing with a body filled with itchy bites. Taking some close-ups of a Moral Eel can help you tolerate the war against bug bites when back on the surface. Having a good camera at that moment certainly helps. Green Moray Eels have unique tube-like protrusions extending from their nostrils called incurrent tubes. The visible front set of teeth of these eels are backed up by a second set of teeth further down their throat which will move forward to grab their prey when feeding, and pull the food down into their throat. These eels are usually not afraid of divers and will sometimes allow this sort of approach to within a few inches, if the diver stays very calm and gentle. Joan Carter - I believe it is the Seagate Olive Leaf Cut and Wound remedy. Joan was answering a question from a contest that we just placed on the Seagate Facebook page. In order to win a free T-shirt and a free bottle of Cut & Wound Remedy, it was necessary to click on a specific blog link Boiling Bug bites to reduce the histamines and itching and actually read it … and find the answer to the question — “Which of Seagate’s products is suggested as an alternative remedy to help alleviate itching from bug bites?”. Unfortunately for Joan, Cut & Wound Remedy was never mentioned in the blog as a remedy for itching bug bites. One Seagate product was mentioned. But you have to read the blog to find the answer. This contest was really a test of the Facebook audience to see if anyone was actually clicking through and reading the articles. Yes, there are a few.